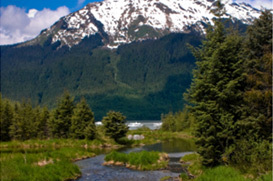 Peters Creek, Alaska Real Estate Explore Homes for Sale in Peters Creek, AK! Peters Creek (Chugiak), Alaska is an unincorporated area located about 20 miles northeast of Anchorage. Its 8300 residents enjoy the close proximity to town, but even more, the great outdoor activities that abound. The original name of the area, “Chugiak” means “place of many places” in the original Dena’ina language. Settled in the 1950’s by homesteading World War II veterans, today, housing in the area is rapidly expanding. That’s not surprising, because those who live in the Peters Creek area can live the rural life while still enjoying wonderful restaurants, great schools first class hospitals, shopping at area malls and nearby access to the Anchorage Rail Station and airports. Add it all up and Peters Creek has something for everyone. In addition to the great outdoor activities, you can do some pretty unique things in the Peters Creek area. If you tire of watching the local wildlife, including bears, deer and elk, you can catch a flight out of Merrill Field, Anchorage’s private airport and soar over Chugach State Park or on a night flight, catch the Auroras from high above the Matanuska-Susitna Valley. It will be a memory to cherish for a lifetime. If you live in Peter’s Creek, you’re bound to enjoy something out of the ordinary, so why not take a mid-winter trip to ride the waves at H20asis, an indoor water park in Anchorage. What better way could you beat the cold weather blues? Need more? How about golfing in January? The Tanglewood Gold Dome features an indoor driving range, complete with pros who offer lessons. Not your style? The Sportsdome has batting cages, soccer fields and a 400 meter running track. By now, you probably understand that living in the Peters Creek area of Alaska is a step above ordinary living. It’s Alaska at its best and it is waiting for you! What are you waiting for?